Jamaica Plain residents Robyn Ochs and Kai Imperial-Jewett waited for the start of the annual parade on Saturday. When Cheryl Wilson took part in her first Boston gay pride parade in 1987, she said, participants gathered on Boston Common, a bit scared, and feeling as though they were part of a rebellion. Wilson has been to about 20 parades since, and said that although the world is now more accepting, each parade has been just as meaningful as the last. 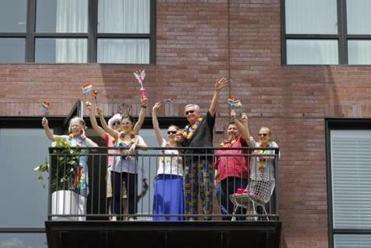 “It still moves me,” said 52-year-old Wilson, who attended Saturday afternoon’s parade with her wife of 11 years. Thousands of people marched, danced, twirled, and roller-skated through the city for the 45th Boston Pride Parade. Cheering crowds in colorful attire overflowed the sidewalks and poured onto the streets. The warm weather and clear skies drew a bigger turnout than last year, said Sylvain Bruni, president of Boston Pride. Bruni said that even in Boston, where strides have been made for equality, members of the LGBTQ community still need to be able to express themselves freely and feel comfortable. Saturday’s warm weather drew a large turnout, with 25,000 people estimated to be walking in the parade. “There’s a need to show pride — for the visibility of the community and so that everyone has a safe space to celebrate themselves,” he said. Howard, a transgender woman, said she was walking so she can be herself. “I want to make the world a better place for women like me,” she said. The gay rights movement has come a long way, she said, for the gay, lesbian, and bisexual communities, but a lot more needs to be done for transgender rights, such as ending violence against transgender people and preventing suicides. “In the last few years, there’s been a lot of progress with celebrities coming out like Laverne Cox and Caitlyn Jenner,” she said. Chelsea Feuchs, 22, of Jamaica Plain, who was also walking in the parade, said that when she was 12, her mother came out as gay. At the time, it felt more taboo, she said, and Feuchs only told a few of her close friends. 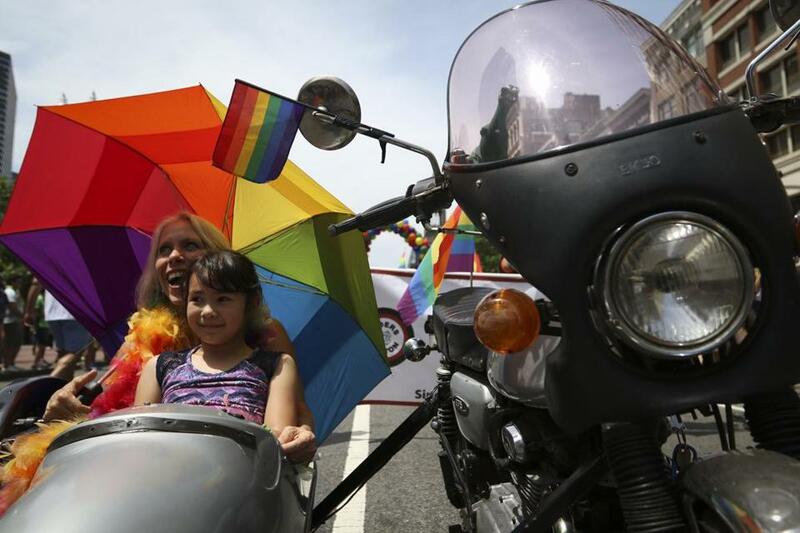 The parade kicked off around noon when Mayor Martin J. Walsh cut a rainbow ribbon as about a hundred motorcycle riders revved their engines at Copley Square to signal the start. The groups represented about every imaginable part of Boston: churches, university groups, hospitals, law enforcement, big corporations, like Wells Fargo, and regional groups, like the New England Asexuals. Parade-walker Manny Sorto, a member of a Latino pride group, said there is much more that needs to be done before equality is achieved within minority groups. The Rev. Jeff Mansfield of the First Church Somerville proudly led a group of his parishioners, a substantial proportion of whom are from the LGBTQ community. He said he preaches that homophobia is a heresy, and he said society must dissuade people from thinking that being gay is wrong. “We come to represent who we are as queer folks, and as Christians,” he said, adding that he also couldn’t miss Boston’s biggest party. Andria Cargill, 26, who watched the parade as it wrapped around Boston Common, commented on how this parade is where she feels safe. “There’s no fear here,” said Cargill, a barista from Watertown, who attended with her girlfriend. Around 1:30 p.m., the parade began to reach its final destination at City Hall Plaza. Floats deposited rainbow-clad riders under balloon arches, which led participants into the Pride Festival. The festival featured booths from national and local businesses, with representatives handing out free wristbands and necklaces to the crowd. As she stood on the plaza, Chantel Deane, 26, of Brighton, said that the parade is a visible mark of progress. “When you have a big city like this surrounding pride, it shows the rest of the country that we’re in this together,” Deane said. Katherine Landergan can be reached at katherine.landergan@globe.com. Claire Nobles can be reached at claire.nobles@globe.com. Follow her on Twitter @cnoblez.